It has just occurred to me that nearly everyone whose image appears on this blog has a beard. Not all of them are as luxuriant as that of Tsar Nicholas, but there is a distinctly high level of facial furniture on display. I have recently lost (well, I say lost; more disposed of) my rakish ‘tash that was an integral part of my NYE costume, and Movember fund raising efforts. (New Years Eve revellers might have caught a fleeting glimpse of the ginger lip bush when Thomash and I arrived at the Blitz Party dressed as Spitfire pilots…) And it was with this sense of loss, and cooling breeze across the facial bows, that I considered how it is that Naval Officers always seem to have full and established beards? Are there are days at sea when young Lieutenants are confined to their quarters until their growth becomes acceptable enough to be seen on deck? Are Petty Officers issued them as they take their shore leave? Does the Admiralty offer discounts on beard trimmers to Senior Servicemen? Do they all get razor rations? Are you never ever sick at sea? A prize for anyone who can guess who this bearded sailor is.. 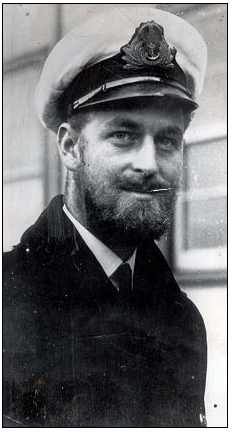 The growing of a beard whilst serving in the Royal Yacht is permitted provided that the beard is respectable by the time the Standard is broken and the first time it appears in public. The rules are as follows: The granting of a request to discontinue shaving will carry with it an automatic stoppage of leave for 14 days. At the end of this time the beard will be inspected and a further 14 days stoppage may be given. Should the beard still be untidy after 28 days the order to continue shaving will be given. The stoppage of leave applies to members of all sports and recreation parties where there is the slightest chance of meeting anyone outside the Royal Yacht. Requests for leave to take part in representative games will not necessarily be granted. Except for medical reasons a request to continue shaving will not be granted within 6 months of the granting of the request ‘to grow’.Since the appearance of Royal Yachtsmen in public must be impeccable at all times, permission to grow may be withheld from Quartermasters, boats crews and other Royal Yachtsmen whose duties are likely to take them ashore after the request is made. So now you know. Hi, I have loved your awesome website. I have bookmarked your site so, will check in now and then. Thank you!